Because of my true belief of this cause, I decided to send my coin to the wonderful Ellen DeGeneres, and to pay if forward with help to a wonderful group of people I work with.... This is the letter I included with the coin. About 16 years ago, around the same time you started your talk show, I was going through a very hard time. I was a single parent of four beautiful children and I struggled every day to make ends meet. Lucky for all of us, I met a wonderful man who was also a single parent of four. We became a very large family in a blink of an eye. The financial stress of raising eight children often became too much for us. We always found a way to manage. There were times, especially in the beginning, that we had to ask for help. Needing assistance from the state and from local non-profits was a very humbling situation. I often felt broken. As a mother, you learn quick that personal pride doesn’t make the list of importance when it comes to your children’s wellbeing. I remember once, in that first year, sitting at a community action agency while they were organizing some unemployed men to shovel driveways for the elderly. With every part of me I wanted to help. Unfortunately, with all my kids in tow, there was just no way. Later that evening, my daughter Kim asked me if we could make something in the kitchen. We spent the next afternoon baking 20 dozen muffins for all the men shoveling and the elderly they were helping. For the first time in so long, I finally felt the joy of giving. From that moment on, I have always found ways of paying it forward to others in need. My children and I have spent countless hours volunteering in our community and it has become one of our “family things” we do. Here we are years down the road, and the last three years I have worked for Valley Vista Vista Care Sandpoint, a wonderful non-profit Skilled Nursing Home in beautiful, Sandpoint Idaho. We have up to 73 residents that live here and rely on our care team for 24-hour care to meet their day to day needs. I work as the Assistant Dietary Manager. This is not a job I would have ever imagined doing, but I truly love what I do! I get the creative privilege to have “fun with food” for our residents. Sometimes it means making colored pasta that looks like clown hair for Halloween or figuring out how to make a puree candy bar for a lady who wants a chocolate bar but cannot safely eat one…we figure out how to make it happen! Every day I see the Nurses and Nursing Assistant’s going above and beyond the call of duty to calm or redirect a confused resident. They are always laughing and telling stories, discussing football games, what’s going on in their family’s lives, playing games, doing crafts, or just reading a magazine. We have staff that buy Christmas and birthday presents for those residents who don’t have other family besides us. Our Administrative staff and Therapy Department are always going out of their way to find outside community resources for residents who may be able to go home. I have seen them spend days off hauling and splitting firewood for a resident’s wife or driving to a family member’s home to haul a special chair for someone who has just come to stay with us. Honestly, I could spend days telling stories about how awesome these people are. Most importantly, we share much love and have a lot of fun! Our staff, residents and family members have become like family; celebrating in the good times and supporting each other in the difficult times. Now that I shared some background, I want to share the REAL reason I am writing you! Recently at Valley Vista Care Sandpoint, Sheila a coworker of mine gifted me with a beautiful Blue Butterfly Coin to recognize a kind deed I had participated in. I had helped pull together a special anniversary dinner for a resident of ours who has terminal pancreatic cancer. It was his and his bride's 15th wedding anniversary and probably his last celebration of it here on this earth☹ Determined to make his last days as incredible as possible, we quickly planned a dinner hosted at our our facility. It was complete with a private meal, sparkling cider in champagne glasses, 12 red roses + 1 white rose and gifts for his wife! It turned out beautiful and they LOVED the thoughtfulness behind it! A memorable day indeed! Sheila had recently initiated a Staff Appreciation program called “Operation Butterfly Effect” using these beautiful coins. She got the idea after a talking to a good friend, Bruce Pedersen, who was in visiting a family member in our facility. He shared the concept of The Butterfly Effect which is the scientific theory that a single occurrence, no matter how small, can change the course of the universe forever. The concept is simple, the effects are profound! Perfectly aligning with what we stand for at Valley Vista. Bruce and his friend Ron Hornbaker had taken this concept and cofounded Butterflycoins.org. Each Butterfly Coin inspires and tracks the butterfly effect of kindness. By carrying one of the solid brass coins in your pocket or purse, you’re reminded to look for opportunities to help someone. It can be a friend or stranger. The coin is passed on to them along with a kind deed with the encouragement to pay it forward to someone else. Each coin has a unique tracking code on the back, along with instructions to the recipient to make a brief story note about how they received the coin. Each coin has a dedicated story page, where you can watch the legacy of kindness unfold countless times into the future, forever. The conversation that ensued was phenomenal and before he left, he gifted her with a Butterfly Coin. Sheila and I are also planning a Staff Appreciation Party on February 15th, 2019 that coincides with The International Random Acts of Kindness Week. We will officially launch our “Operation Butterfly Effect” at Valley Vista Care to celebrate our staff as they Pay It Forward every day. 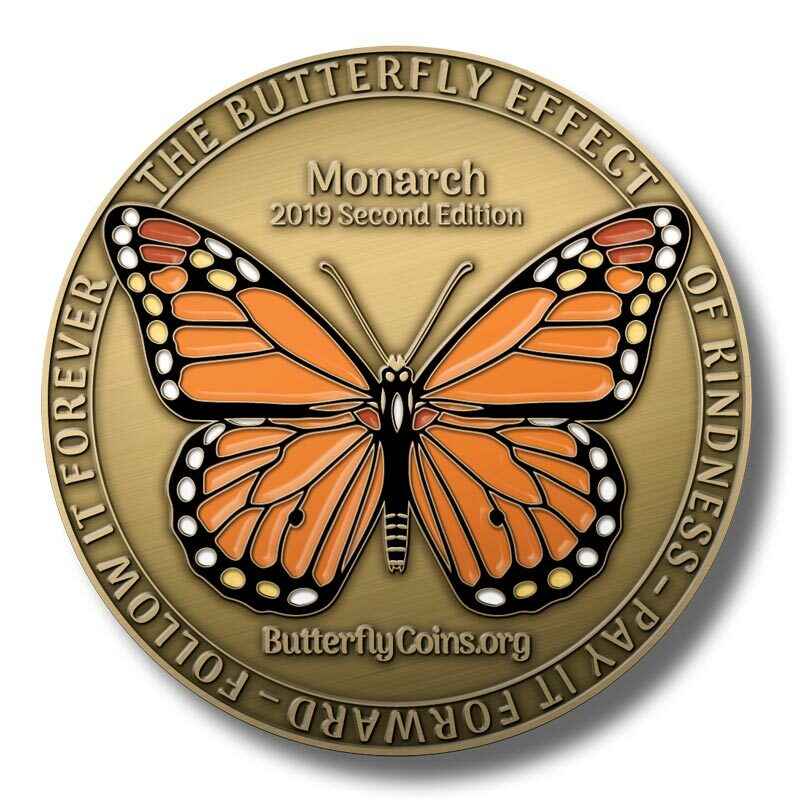 We plan to share the stories of the first 20 Butterfly Coins that have been launched in our facility and have fun surprises and RAK for our staff! As one of the first employees to be given a coin, I wanted to do something very special with it to launch it into the world. I am sending it to you to recognize you for going above and beyond to help so many, including me. At the heart of it, you have become an inspiration to me through your positivity and encouraged me to do good and help others. The world is a better place because of you!!! You began your very own Butterfly Effect! !